The “Barbe Black” has a dense head. Its taste is well-balanced and keeps the middle between sweet, creamy and bitter. “Barbe Black” is one of the four “Barbe” beers. 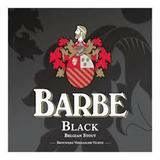 The name of the series of “Barbe” beers refers to the Liege brewery “Barbe d’Or”. Brewery Barbe d’Or was a medieval brewery in the old town of Liege (Belgium) and belonged to the family “de Romsée”, an ancient Liege family whose coat of arms adorns the logo of the “Barbe” beers. hops gives the “Barbe Black” its gentle taste of bitterness and its dense head. “Barbe Black” has an alcohol content of 9.0 % alc. vol.